Special services: A fleet of Mercedes-Benz cars rented by Emirates Airlines outside Chhatrapati Shivaji International Airport, Mumbai. Hotels, too, are using luxury cars to pamper premium customers. 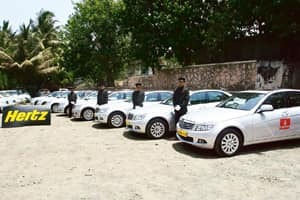 Mumbai: The country’s still-fledgeling luxury car market, comprising automobiles priced at Rs25 lakh or more, is poised to expand by almost 50% this year and next, driven partly by rising demand from the so-called hospitality sector including premium hotels, resorts and tour operators, treating their guests to a plush ride. The Leela Palaces Hotels and Resorts recently bought 50 BMW 7-Series and 20 Nissan Teanas and X-Trails for its properties across the country, said Vivek Nair, chairman and managing director. And the hotel company plans to acquire the so-called super luxury cars, which typically cost three times as much as luxury marques. “We are looking at buying a Rolls-Royce or a Bentley for our upcoming property in Gurgaon," Nair said. “We are in the top-end of the luxury business, it’s hence extremely important to have high-end cars for our customers. The experience begins from the airport itself." “The hospitality segment accounts for almost 10% of the total luxury car sales," he said. “With the new hotels coming up even in small cities such as Pune, this percentage will only grow further." At least 15 luxury hotels are coming up in Mumbai, Bangalore and the National Capital Region centred around New Delhi, with many more being constructed in smaller cities such as Agra, Jodhpur and Udaipur, said Bhavesh Gandhi, a Mumbai-based analyst at India Infoline Ltd. The average duty on completely built cars in India is 114%. But hotels and tour and travel operators can import completely built cars paying only 3% duty under the so-called Export Promotion Credit Guarantee scheme, provided they have logged foreign exchange earnings of at least Rs1.5 crore in the current and last three years. “Hotels are one of the most important segments for the luxury car makers—whether they buy them directly, lease or rent them," said Pankaj Aggarwal, business head at LeasePlan India Ltd, a car leasing and rental firm. “This is mainly because hotels are now looking at positioning them differently and carving their own niches." Bayerische Motoren Werke AG, or BMW, sold 1,387 cars in the country in fiscal 2008, but only 50 of them to hotels. Peter Kronschnabl, president of BMW India, hopes to sell a total of 2,800 units this year, of which 100 will likely be to the hospitality sector. “If you compare the number of five-star hotels in India that offer luxury cars to its customers with that in Europe or the USA, the number is very small," he said, adding that leaves room for growth to accelerate. Audi AG, another German car maker that sells the A4, A6, A8 and Q7 brands in India, has 11.5% of its sales coming from five-star properties such as resorts and heritage hotels. “Almost 15 of the 130 units sold per month are in the hospitality sector," said Ravi Rastogi, head of corporate sales at Audi India. Japanese auto maker Nissan Motor Co. Ltd, which sells the X-Trail and Teana brands, is also looking to luxury hotels for a portion of sales. About 15% of its sales in the country come from the hospitality segment, a Nissan India spokesperson said. Luxury car makers may be hopeful about increasing demand from new hotel projects, most of which are expected to be ready only by October 2011, but some analysts caution that the global financial crisis and domestic economic slowdown could make hoteliers cut spending. “With occupancy in the hotels going down you would have lesser number of guests to service," said India Infoline’s Gandhi. “There would hence be some pressure as far as leasing or purchasing of luxury cars is concerned."